Two Budpak bag filling and closing lines were recently commissioned for a fertiliser supplier based in the South Pacific. Supplied by Accuweigh’s Budpak Branch in Newcastle, the bag filling and closing lines included gross weight baggers with semi-automatic sewing stations to close the filled bags. Custom designed to suit the client’s existing plant layout, each gross weight bagger is fitted with two different bag-holders to suit the two bag sizes currently being used. Quick release mechanical and pneumatic fittings were fitted to both baggers to facilitate quick changeover between the two sizes. 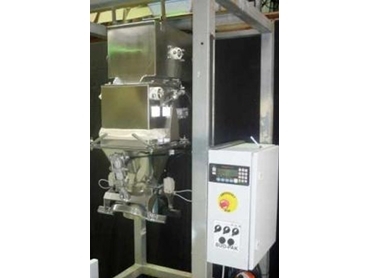 Fully manufactured in Australia by Budpak, the bag filling machines feature full stainless steel construction for an extended working life in the highly corrosive environment. Product is belt fed into the gross baggers to achieve the client’s required product rate of 450-550 bags per hour at an accuracy of ± 100 to 200g. Scope of supply for the bag filling and closing lines included factory testing, export packing, delivery, installation, commissioning, product training and spare parts. Accuweigh /Budpak is one of Australia’s largest weigh packaging companies and has eight branches across mainland states providing superior product support on all weighing, filling and packaging equipment. With hundreds of bag filling and palletising installations throughout Australia and the Asia Pacific, Accuweigh/Budpak’s extensive industry experience is your guarantee of service and product excellence.